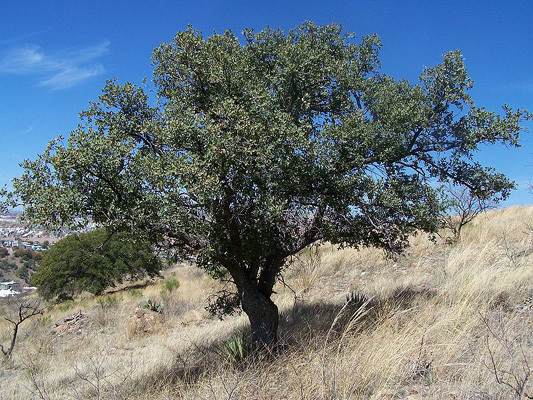 A native from Arizona to Texas to northern Mexico. Rounded growth habit to 50' tall. Furrowed black bark with semi-evergreen foliage. Leaves are dark green, oval, with sharped toothed edges, 2" to 3" long. Turning gold or yellow and dropping before new growth in late spring. Annual acorns ripen June through September. Can tolerate a wide range of soils. Slow to moderate growth rate. 50' tall x 40' wide. Does well in the desert southwest. It has a slow to moderate growth rate.